By now you know I have a mild obsession with peanut butter. But this takes it to a whole new level. 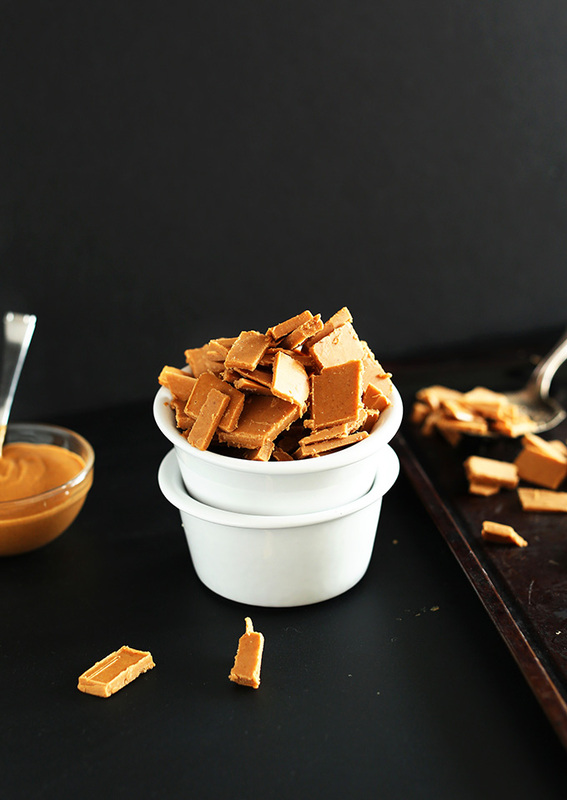 I’ve found a way to make peanut butter a melt-in-your-mouth baking chip! Three high fives for this much-needed discovery. It’s a given, but the magic starts with peanut butter. Then for sweetness and texture we add agave nectar and powdered sugar. And lastly, to thin it out and help it firm up and keep a “chip” shape, melted coconut oil. Mixy, mixy mixy time, then pour baby pour. Next? Pop it in the freezer – the longer the better. But impatient minds will be happy to know that I tested it at 30 minutes and, although it was more prone to softening while cutting, it did work! You’re basically just looking for a very firm sheet that can be easily cut and broken into chips. Now, these chips are not like regular baking chips, which contain preservatives and additives to help them keep their pure shape when baking. These will soften up a bit more during baking. But the flavor is there 100%. 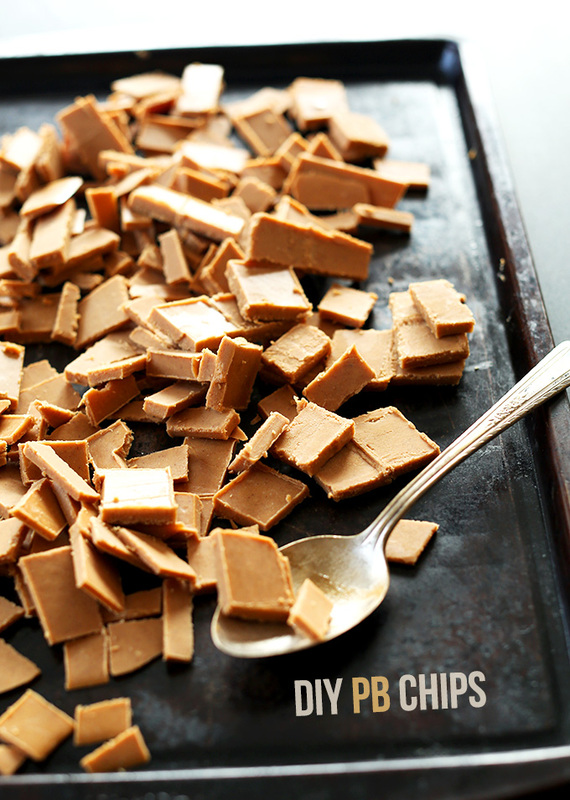 Trust me, I have a cookie recipe featuring these bad boys coming up soon that showcases their peanut buttery glory. Another difference? You’ve gotta keep these in the freezer to help them stay fresh and keep their shape. “Boo hoo, that’s a bummer,” you say. Well, I say the benefit of this fragile handling and care is that you get vegan, gluten-free baking chips that are made from four simple ingredients and are additive- and preservative-free! That’s a pretty fair trade-off, no? You name it, these will do the trick! Have fun, friends! 4-Ingredient DIY Peanut Butter Chips perfect for adding to baked goods or eating straight out of the bag. Place a sheet of parchment paper on a rectangular baking pan (as original recipe is written // adjust if altering batch size). Set aside. 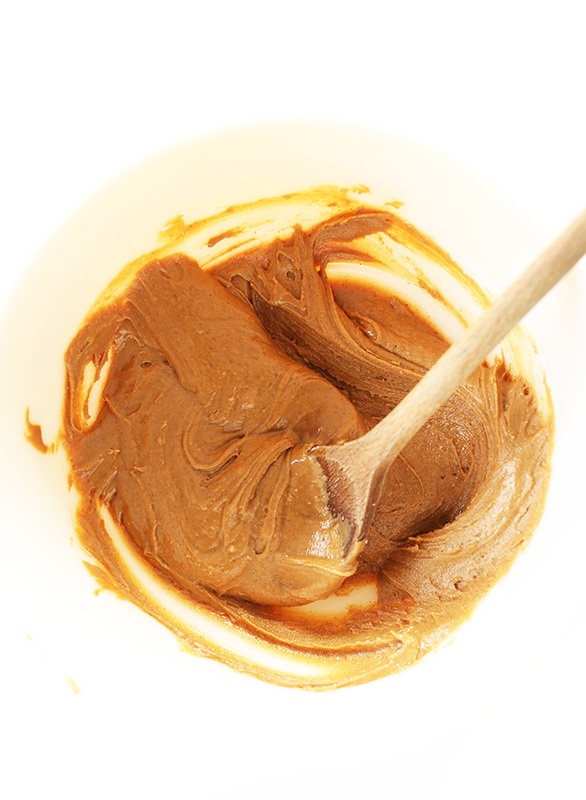 To a mixing bowl, add peanut butter, powdered sugar, and agave and stir. Add coconut oil and mix until thoroughly combined. It should be thin and pourable. 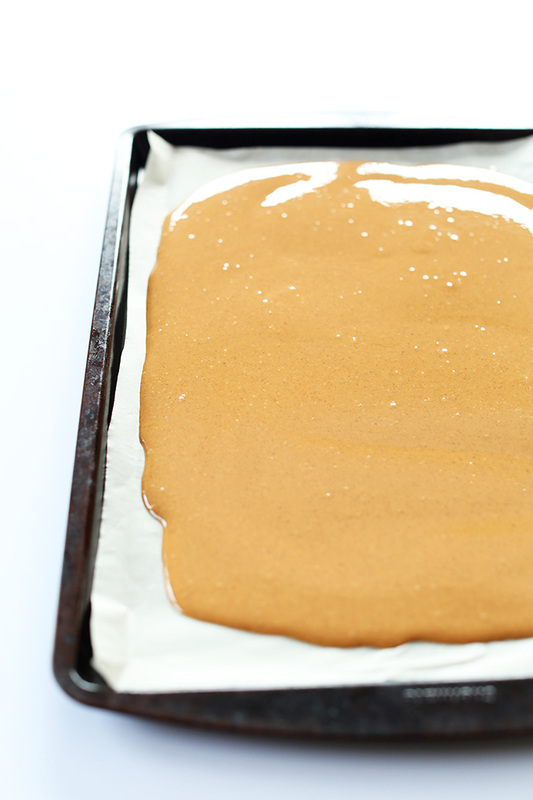 Pour mixture onto parchment-lined baking sheet and spread with a spatula or spoon until uniformly thin. You don't want it too thick in any one area, so try your best to make sure it's even. Pop in the freezer until very firm - at least 30 minutes, but up to overnight or 4-6 hours. The longer it sets, the easier it will be to cut up and break apart. Once firm, use a knife or pizza cutter to break it into chips. Loosen with a spoon or spatula to help break apart once cut. At this point, especially if your kitchen is warm, the chips will start to soften. These chips need to stay in the freezer! Transfer chips to a freezer safe Tupperware container or bag and store in the freezer until ready for use. When adding to a recipe, keep in the freezer until adding to your batter. And if you batter is too warm (if it's been heated or cooked in some way) it will melt the chips. So be sure to add the chips to a room temp, preferably chilled dough. They will bake as regular baking chips do flavor wise, but because they contain no additives or preservatives to help them keep their shape during baking, they will melt a bit more than store bought. But because these are much more wholesome and natural, I much prefer them to store bought. Will keep in the freezer for 1 month or more. Yields ~2 cups chips. *Recipe makes ~2 cups peanut butter chips. *Nutrition information is a rough estimate calculated with agave. What’s up to all, as I am actually keen of reading this website’s post tobe updated on a regular basis. It consists of niceinformation. These look amazing! Do you think I can make them in silicone chip molds instead? I’ve really missed peanut butter chips in my cookies since I became vegan! All that is available where I live is Reeses brand and they have milk in them. Thanks! Yes, that should work, Tammy! I used cannabis infused oil and melted some vegan chocolate chips and added them too!!! Can this be used in moulds please? That would be preferable actually! 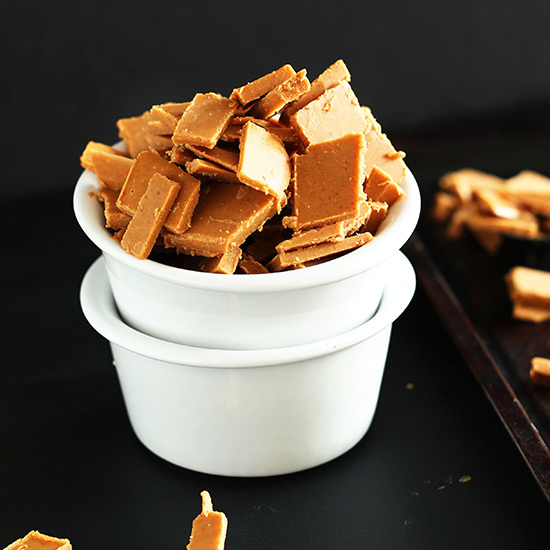 Could you use these in making fudge? We haven’t tried! But if you do, report back on how it goes! So, I want to make the cocoa butter version of these that you refer to as baked…can you give me the details of how long and what temp to bake them at please! Hi. I want to try this but I wonder if there’s a way to ensure firmer chips that wouldn’t melt in room temperature, more like baking chocolate chips? Maybe replacing the coconut oil with cocoa butter? Could I use honey in place of agave nectar? I can’t easily source agave where I live. Hey there! I have made these before and oh my goddess they are incredible! I had the thought that I could potentially make them (sans powdered sugar) and use them as frozen dog treats for the summer! Do you think they would hold up without the sugar? Hi Tracy! I’m not sure – but check the other comments for sugar substitutions. Hope this helps! Just found these…great idea. Do you think I could use stevia instead of the powdered sugar? Do I need the honey/agave syrup in order for it to set up properly? Maybe I could make a syrup out of a date ‘jam’ I could make instead? They will be soft, due to the nature of coconut oil! I’m off refined sugar and wondering about leaving the powdered sugar out… Any suggestions? I don’t have access to agave syrup. Can I substitute honey? That should work! Or maple syrup. I ll definitely try it!!!! Do regular peanut butter chips have flour? Would using amaranth flour make them more solid. It’s gluten free. Will this recipe still work if I use natural almond butter? I just put these in the freezer! I added some cinnamon to the recipe, can’t wait to use these in a cookie recipe!!! Add a little Thai Red Curry Paste for some extra Ziiiing. A little goes a long way, yummm. 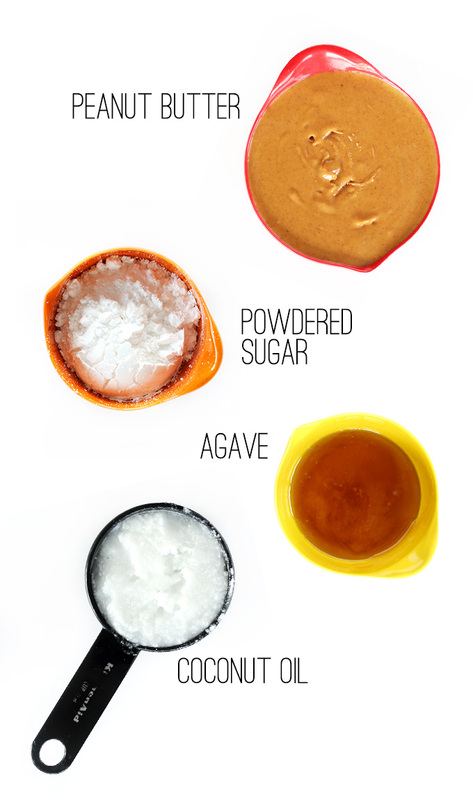 You should be able to mix in honey with agave, or swap it out entirely! 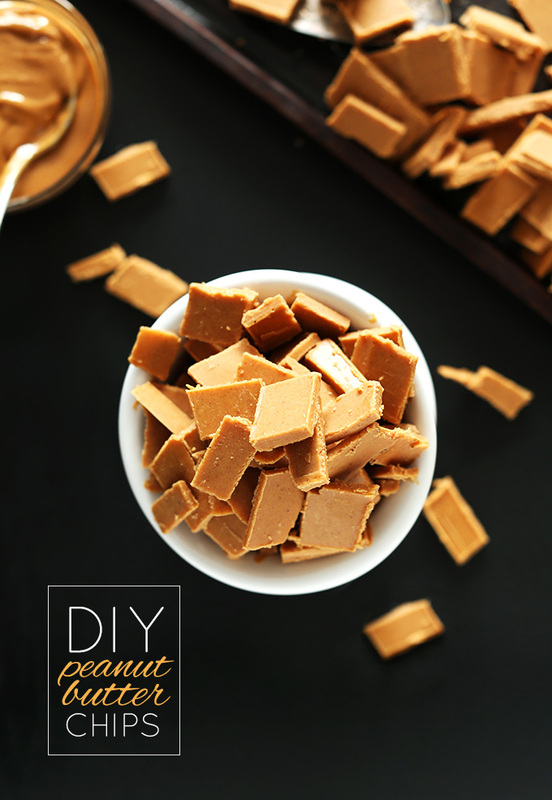 If anyone is a crunchy peanut butter lover like me, I am happy to say that crunchy peanut butter works amazingly well with this recipe! Delicious and love the texture! My chips are finishing up freezing at the moment, and I can’t wait to snack on them soon. Thanks, Dana! Of course! Thanks for sharing, Melissa! Can I substitute the powdered sugar for coconut blossom sugar. I don’t want to use refined sugars any more after my No Sugar Challenge this month. Not sure but it’s worth a go! Let me know if it works if you give it a go, Deborah. These look so delicious!! I can’t wait to try to make them myself :) Thanks for the awesome idea! Uh Oh! These look so yummy I think I would eat the whole thing myself just as they are! These look so good! Do you have a recipe for homemade chocolate chips as well? I don’t but I’ll have to add it to my list!! how creative can we get here? FUN!! these would be perfect for tucking into homemade healthy chocolates in the center of the mold, a little surprise! YUM! i can also see a couple squares on top of sliced bananas on hot pancakes… thanks for the inspiration!! I just bought a HUGE jar of peanut butter because it was on sale. Going to the kitchen now to whip up a batch of these beauties! I would love to try this but I’m trying to replace all of my recipes with natural sweeteners so any ideas on replacing the powdered sugar? Could I use coconut sugar and pulse it in the food processor? Rochelle, can you consume raw sugar? If so, process raw or turbinado sugar into powdered sugar to a similar effect. Otherwise, you could try using all agave or maple syrup (or honey if not vegan) and seeing if it stiffens up w/out the powdered sugar. 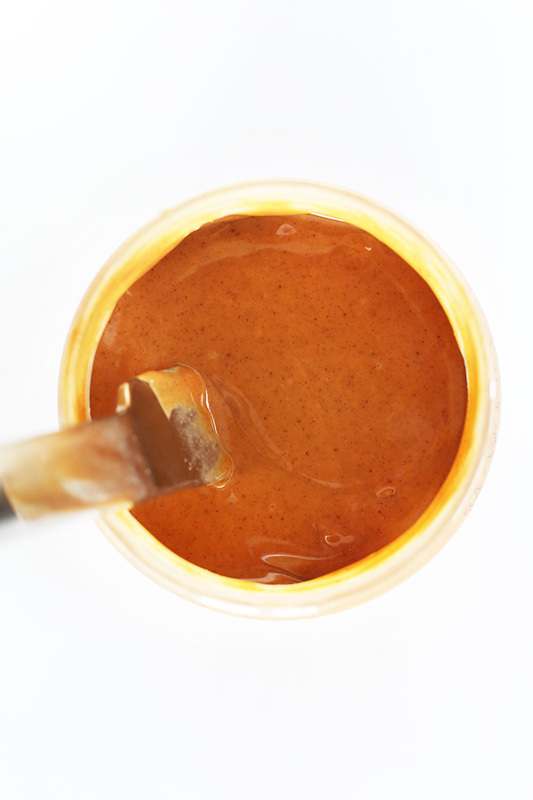 I’ve also heard that honey (again if you’re not vegan) can help nut butters stiffen. Hope that helps! What a fabulous idea! 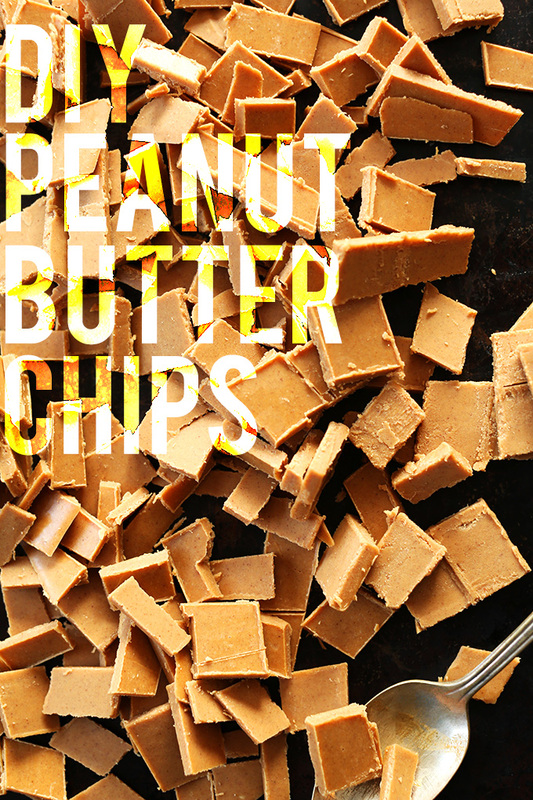 I very much doubt we can buy anything like a peanut butter chip over here in Europe (certainly not very easily), so this is a great recipe to have bookmarked. So … bookmarked! I’m not sure these would make it to the baking stage for me, I would be constantly making trips to the freezer to snack on them! they look so delicious! This reminds me of the peanut candy we ate in China when we were kids. So addictive. Ummm…could I just add these to my mouth?! Deliciousness incarnate. We can’t buy even the preservative filled peanut butter chips over here in Australia, so I am so glad that I can make my own – and make them healthier too! Now, I’m off to daydream about all the things I can bake these into. This makes me SO happy. Peanut butter chips trump chocolate chips any day in my book, but I don’t buy them because of all the crazy stupid ingredients. Making these in bulk this weekend! Brilliant! I wonder if I could tweak this recipe to make cinnamon chips. I love them in scones but they have really yucky ingredients. This looks AWSOME! I’ll give them a try the next days! Beautiful photos! Genius. You are a pure genius. I could cry I am so happy about this. And that first photo rocked my socks off. Great styling! Wowwwzersss are you kidding me? Homemade PB vegan chips!? I am in heaven! They have yet to get peanut butter chips (or really good peanut butter) stocked on the shelves here in Belgium and this might just be the answer to all my peanut butter prayers (ahah!). Looking forward to that cookie recipe using these PB chips! Do you have any suggestions on a peanut butter topping though? I’ve been wanting to make my own, but can’t seem to get it right. My mom loves to put extra peanut butter topping on her ice cream (no, she’s not vegan!). I’ve used it to drizzle on cakes and brownies too. I didn’t know if just adding agave or honey would sweeten it enough and thin it out to make a thick sauce. Jolene, if you make this fresh it is pourable and will firm up on contact with a frozen treat (like magic shell). But another option would be just sweetening peanut butter with agave or honey or powdered sugar and then thinning it out with almond milk until pourable. Hope that helps! Could you use some other kind of fat (like butter if not vegan) if you’re allergic to coconut? AJ, see the above comment, but I suggested to another commenter that another neutral oil such as grapeseed or canola would work best. I wouldn’t recommend butter. From everything I’ve been reading/researching, Grapeseed & Canola oils are really bad/unhealthy!! plus, they don’t harden up like Coconut oil?? I thought agave was a bad food for healthy-ness? I really don’t know, have only read in several places that its a no-no. 1 tsp contains nearly 5 grams of sugar, so if you have an issue with insulin, etc it wouldn’t be a bad idea to check with a nutritionist. Wow, I would never have thought to try to make my own peanut butter chips! And yet I definitely have some serious love for peanut butter in baking. Must try! Is there something I can use instead of coconut oil in recipes? Pam, I haven’t tried this recipe with any other oils, but I suspect it would work. Try something neutral, such as grape seed or canola. If you do, let me know how they turn out! You could substitute palm oil. I’m going to try adding some cocoa butter to see if it will harden more. These look like they would just melt in your mouth! I hate how regular peanut butter chips have so many weird ingredients. I can’t wait to give these a try! The store bought ones rarely actually TASTE like peanut butter too! I bow down to you, goddess of peanut butter! And I to you, oh goddess of croissants. They are in the freezer! So quick & easy to whip up – love it! I used chunky versus creamy, since that’s what I have on hand & maple syrup. Found you via Pinterest! So smart! Let me know how you like them, Heather! I played around with some peanut butter chips once and they were just a melty melty mess. Yours looks phenomenal and I imagine they taste great on waffles! Can’t wait to see your cookie recipe using the chips. Pinned. Yeah! Stay tuned. They’re quite delish. Thanks Katy! Exactly. I love that they look homemade. Atop ice cream or froyo, these would be a dream boat. Enjoy! Oh, this is clever!! I’ve made my own chocolate chips for cookies before but never peanut butter chips. Making these asap. DIY Chocolate Chips! You’re so smart, lady! It’s become more and more clear that I need to buy a food processor!! I SO look forward to your recipes and this one is AWESOME!!! What a delicious treat to add to chocolate chip cookies or a chocolate avocado smoothie… YUMM!!!! Thanks Carole! A food processor really is invaluable. Invest a little in a good one and it will go a long way! This looks so good, I’ll have to try with another nut type though! Would this work with turbinado sugar or does it really have to be finer/powdered? You could grind turbinado into powdered sugar in a spice mill :D So easy, takes like 5 seconds, and then it’s more natural/less-refined. I want to put these on EVERYTHING. it’s decided, you’re my peanut butter friend!!! THANK YOU!!!! Not only I can’t find any peanut butter chips in this part of the world, but now I can make them more delicious and chemical free!!!! Yay! This makes my day. So glad we could bond over our PB affection! OMG OMG OMG. I need these in my life! Amazing post and pictures. Way to go! Dang, Dana. You’ve done it again. I just want to watch that pouring GIF over and over and over. Looks awesome, and I’ll definitely try this very soon. haha. John gets the hand model credit for that one. Thanks for the love, Lisa! well this is obviously happening. Thanks Lexi! And might I add, your thin mints are brilliant!! I am sooooo making this. We dont get PB chips here in the uk so it will most definitely save me spending alot of money on these. You’re not missing out on much! The PB chips in the states are always lackluster. Hope you enjoy these, Rochelle! This is definitely one of those recipes I didn’t know I desperately needed until I saw it here :) Thank you, as always! Awe, thanks Kate! Hope you enjoy these little gems. 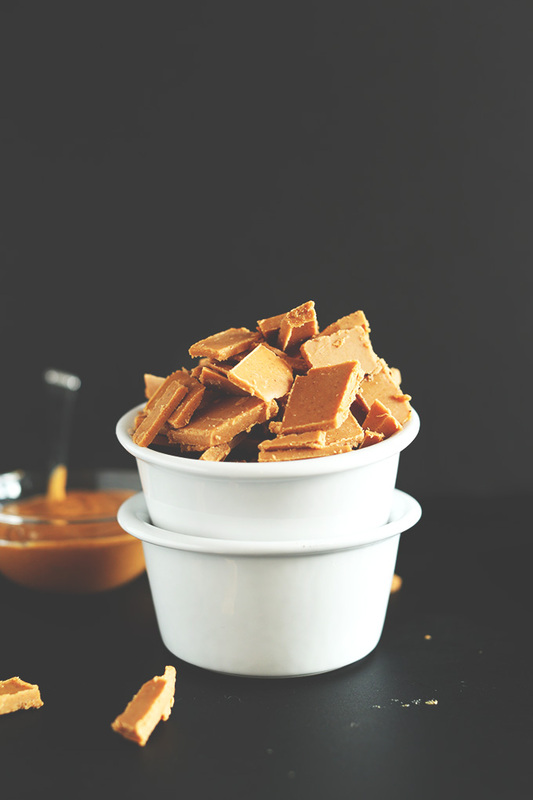 This would be a perfect gift for any peanut butter lover! 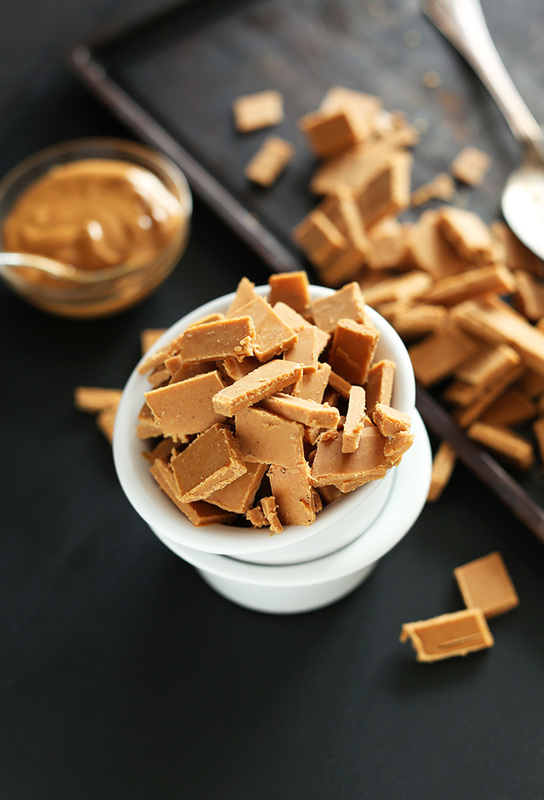 Peanut butter makes the world go round. This just made my day! I love pb chips but I don’t care of the flavor of the store bought brand. I will totally be trying these. Thanks!! The store bought is also hydrogenated. My stoe doesn’tcarr the organic ones anyore. So thans for the recpe. I was also thinking maybe vanilla chips, dark chocolate,white chocolate and caramel chips. Wow, this is brilliant!!! I can think of SO many things that these would be amazing in, I can’t wait to make them!! I’d make these with the intention of putting in a recipe but really I’d just eat ’em all up by themselves. Yum! 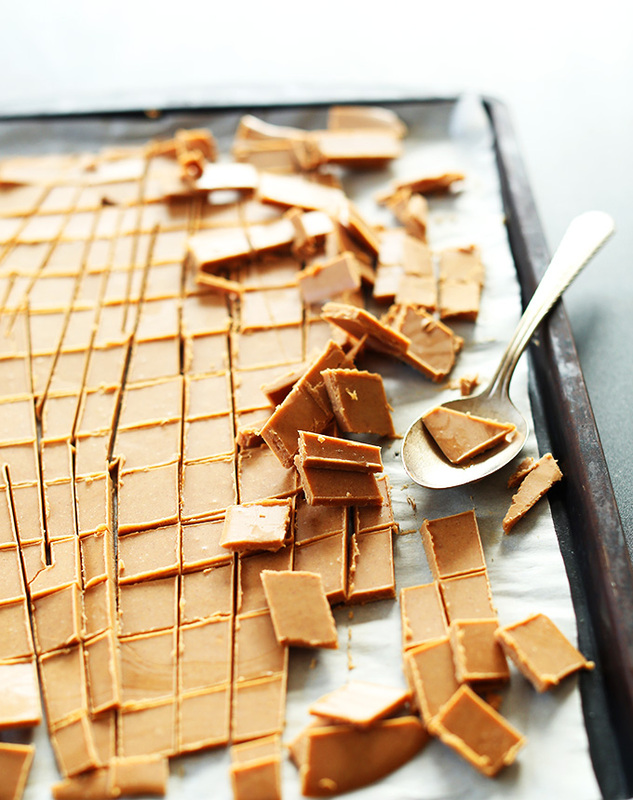 It’s like PB Fudge in a way…but better! The coconut oil, mmm! I have more than a mild obsession with PB :) Pinned! I swear, you have just made my day. I’m a peanut butter addict and I see so many recipes using peanut butter chips but alas, they’re nowhere to be found ’round these parts. To be perfectly honest I’m pretty sure once I make these I will just be continually visiting the freezer to snack on them. It’s true! Every time I open my freezer I’m a little tempted to nibble. But because they’re so natural and relatively healthy, I don’t feel so bad! Hope you enjoy these, Lily.